Michael Farris on the Hannity Show, YouTube screenshot. HA note: The following is reprinted with permission from Kathryn Brightbill’s blog The Life and Opinions of Kathryn Elizabeth, Person. It was originally published in April 2015. Like a lot of other people, I’ve been following the controversy surrounding Indiana’s SB 101, their state level RFRA bill that’s designed to allow businesses to discriminate against LGBT people on religious grounds. Indiana’s RFRA has been compared frequently to the federal RFRA, both by supporters of Indiana’s law who claim that it’s no different thanwhat President Clinton signed into law in 1993, and opponents who point out that it’s much broader than the federal RFRA. What most people don’t realize about RFRA, however, is that while it was a popular piece of legislation that passed with bipartisan support, the religious right had their fingerprints on it from the beginning and always intended it to be used for much broader purposes than most of the bill’s supporters realized. The coalition that drafted the original RFRA was either chaired or co-chaired (alternate accounts on HSLDA’s website say both) by HSLDA founder and then-president Michael Farris. Farris was one of the drafters of the bill, and takes credit for organizing the broad coalition that supported its passage. My astute readers should be able to recognize that language as a culture war dog-whistle from a mile away. Indeed, Jordan Lorence now works for the Alliance Defending Freedom, where he’s spearheaded the string of cases from photographers, bakers, and florists all arguing that they have a religious freedom right to discriminate against LGBT people. We don’t need to rely on dog-whistles, however. HSLDA has repeatedly stated that one of the purposes of the federal RFRA was to allow religious-based discrimination against LGBT people. 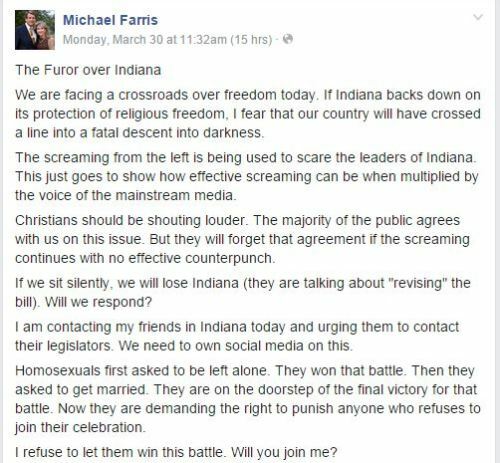 That brings us to yesterday, when, writing specifically about the Indiana law and his intent in drafting the federal RFRA, Michael Farris posted the following to his Facebook page. (screenshotted because his posts have a way of disappearing after I blog about them). Oh noes, how dare the homosexuals ask to be left alone! Look at them there eating crackers like they own the place, don’t they know they’re supposed to be cowering in a closet in fear of the cops busting in and hauling them off to jail? That, Michael Farris, is what asking to be left alone means. In that one line he trivializes centuries of indignities, abuses, and torture that no human being should have to endure. As if asking for even the most bare minimum of basic human rights is too much to ask of society. And no, Michael Farris, it’s not about “demanding the right to punish anyone who refuses to join their celebration.” It’s asking for equal protection under law. One of the bedrock principles of American law, and protection enjoyed by all other American citizens under our civil rights laws. But Michael Farris already knows that, that’s why nearly two decades ago, before any state had marriage equality, HSLDA specifically stated that RFRA was needed in order to overcome nondiscrimination laws. The smoking gun, though, is in the second half of his post. See that last paragraph? Read it again. 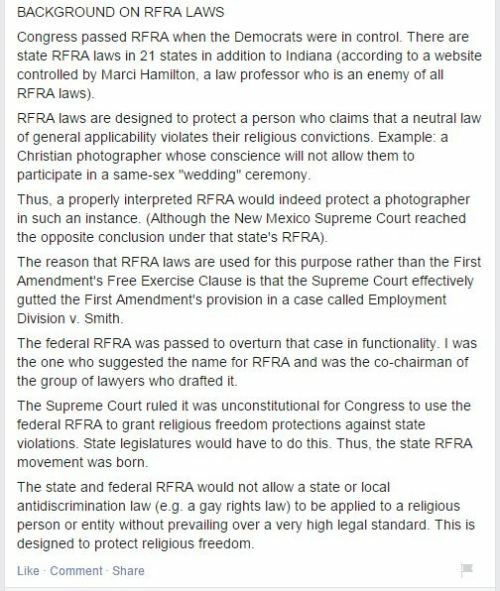 Saying that RFRA would “not allow a state or local antidiscrimination law … to be applied to a religious person or entity without prevailing over a very high legal standard,” is another way of saying that religious people and entities are allowed to discriminate. More specifically, to discriminate against LGBT people. Cloak it in religious language all you want, but the religious freedom that RFRA is intended to protect is the freedom to discriminate. And not just the freedom to discriminate in baking wedding cakes, making floral arrangements, or taking photos either. As was made clear in the quotes above, that freedom to discriminate was always intended to extend to denying LGBT people a place to live and allowing businesses to fire them. I don’t know how you can get any clearer. This is one of the drafters of the original federal RFRA flat out saying that RFRA had discriminatory intent. Discrimination in the name of religion is still still discrimination and it’s still wrong. My followup post, complete with video of Farris’ appearance on Hannity, can be found here.